P.s. how beautiful is that bowl? I bought it at a recent trip to the Jam Factory here in South Australia. Add onion, garlic, celery, carrots and chicken directly in to mixer bowl. When cooking time has finished, remove your chicken to a thermal server and add your serving vegetables (except for the spinach and parsley) to the stock (I dont bother draining it, the stock vegetables are also delicious!). Cook for 10-15 min/90°C or 195°F/slowest speed/MC on. While the vegetables are cooking, carefully shred your meat from the bones without burning yourself, and discard the bones. Pour soup & vegetables over your chicken, spinach and parsley, season to taste if needed, and serve. Replace chicken thigh/leg with 700 g or 24.7 oz cubed chicken breast. Add cubed chicken breast, pepper and serving vegetables (except for the spinach and parsley) to mixer bowl with 2 tbsp chicken stock concentrate. Top water up to max fill line and cook for 10-15 min/90°C or 195°F/slowest speed/MC on or until cooked. At step 2 use speed 1. At step 3 cook for longer if required. Can I use chicken breasts?? One of the best chicken soups made in the Thermomix I have had. what other ones have you tried? Another tasty dish. Added noodles to the kids bowls as well and they enjoyed it, even Miss Super Fussy 6 Yr old! Amazing!! !… After removing the chicken I blitzed the stock instead of straining the veggies awesome flavour. Kids loved it! First time cooking this recipe and Thermo is making struggling noises, is this normal? Fairly new Thermo so don’t want to ruin it. Can I freeze this soup or how long will it keep on the fridge? Planning to make for lunches. Made this today and it was awesome. My boys ate a bowl each straight after school. Thanks for such yummy recipes. Broth is tasting delicious so far! Quick question – is it spinach leaves off of a bunch of spinach or is it spinach leaves that you buy in a salad packet? 5 thumbs up! Absolutely the best chicken veg soup i have ever made. Followed recipe using chicken drumsticks and adding zoodles in last 5 minutes of cooking time. I had no parsley but was still a winner. Even father in law had a serving and he doesn’t like spinach but loved this soup. Thanks skinnymixers team! Absolutely delicious. The best chicken and veg soup I have ever made. I did a tablespoon of iodised sea salt and followed instructions, excepts I used chicken thighs with no bones. Lots of flavour, this will be a weekly dish in the winter time! Thanks for the recipe!! Very enjoyable soup that you can customise to your taste. I added 2 tsps chicken stock and some dried thyme and chilli flakes. Great soup to make when you are sick because the thermal cooker does most of the work. 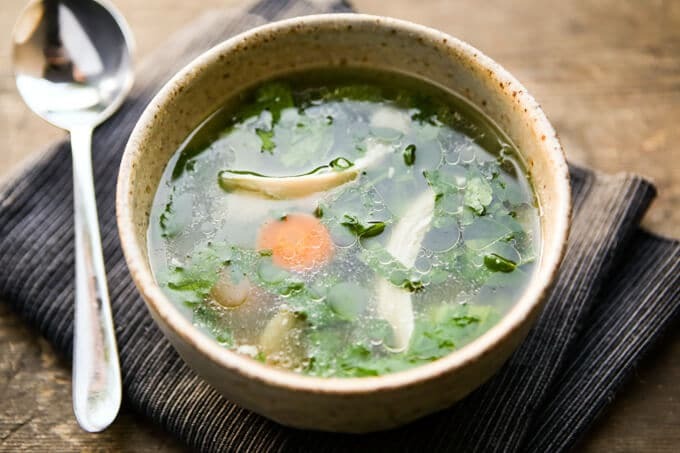 I am getting over a cold and have been wanting to make this soup for some time. I was underwhelmed. I like big flavours and this soup is not it. I added extra vegetables then vegetable stock paste and then worshtershire sauce for flavour. Too bland for me which is a disappointment. Wow wow wow! Tried the quick version as only had chicken breast. Was so easy and fast but blown away by flavour! Served with crispy bacon…mmmmm! This was delicious, exactly what I needed while being sick with a cold. It was so tasty and so easy to make. I made this soup tonight for my daughter who has come down with an awful flu. She hasn’t eaten all day because her throat is so sore and she totally scoffed the lot. When I made the stock I was in such a rush I forgot to chop the onion, so the stock was made without it and it was still delicious. I will definitely made again. Wish the thermie bowls were bigger so we could make a bigger quantity of the stock. That really is yummy and I would like more liquid with my soup. I made this today and the stock didn’t have much taste – it could be because I’m sick and can’t taste much :-). I added chicken stock concentrate (also a skinnymixer recipe) and it’s just fabulous. I love the recipes from this website and the books. I’ve made this tonight for my Dad who has a cold that’s knocking him about a bit. He LOVED it – and so did the rest of us, including 2 of my non-soup loving family members (hubby & 7 yr old). Absolutely love this one! It’s affordable, easy and super yummy – a regular in our house since it was posted. This is hands down the best chicken and veg soup I’ve ever made or tasted. Perfect for a healthy winter lunch! I made this soup yesterday with all intentions of having it for lunch during the week. I now have a problem…. Hubby has pretty much devoured it already! Loved loved loved this soup. Was so tasty and nourishing not to mention easy as! Definitely making this one again. Thank you! Amazing soup. Made this as I wasn’t feeling well. One sip of the soup made me feel much better. Used spring onions and coriander instead of celery as I didn’t have celery at home and it still turned out well. Thanks so much Nik! This is going to be a regular for me this winter! Did anyone else’s thermomix struggle with this? My TM isn’t very old however sometimes I find the blades struggle with certain things and even at the slowest speed it kept stopping and starting. I ended up taking the butterfly out – perhaps my chicken was too large? It was also very noisy as it went around. Any advice from other people who have cooked would be appreciated as maybe it’s my machine? Very tasty recipe. My thermomix (TM31) had the same issue, and the butterfly actually popped out at one point. I just let it keep going, and it eventually quietened down (after things got a bit more mushy). *keep going after I put the butterfly back in. The recipe doesn’t state to use Butterfly though? `That’s what I thought. Re-read the recipe several times. There are other’s who have mentioned the use of the butterfly. I have just put mine in without butterfly. Did yours work out ok? I’m not using the butterfly either? It’s struggling a bit but still going. Love this method with the butterfly- used it to make a minestrone soup with intact veggies, pasta etc.Thanks! This was such a beautiful warming soup to have on a cold day, so full of flavour. 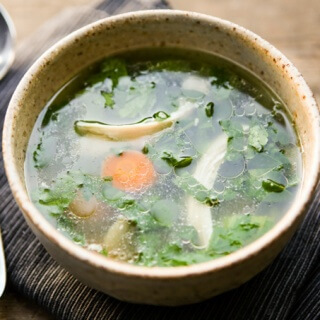 Even my 2 kids wanted to drink the broth, it felt so healthy! The only change I needed to make was to add another 25 mins cooking time on the end because the carrots were still quite hard. I also added some zucchini noodles on serving to bulk it up a bit. Yum, will be making this often throughout the winter months. Thanks for another delicious recipe. Absolutely delicious.. My two yr old twins demolished 2 bowls for lunch (I may have done the same)…. Thank you for yet another amazing recipe. Thank you so much for creating this wonderful recipe. I made it last night and it was delicious. Made this today. It was so good that I immediately tripled the recipe and cooked it in the slow cooker to make enough for a weeks worth of lunches. Thanks Nikalene! Can I ask how long you put it in the slow cooker for (and what temp)? I just made the quick recipe today and it is so nice. I will definitely make the full recipe next time. Thank you for this recipe! I had 700g of chicken breast to make soup with tonight and reverted back to the soup pot as I wasn’t sure of quantities , which was a nuisance because I wanted to go riding with my son, but couldn’t leave the soup pot unattended because it doesn’t turn itself off when its finished! Can’t wait to try the bone broth version, thanks again! Thank you for all the time n trouble you take.